Palestinians Condemn Closure Of Disputed Religious Site In Jerusalem : The Two-Way Israel closed the Temple Mount, holy to both Muslims and Jews, following an assassination attempt against a Jewish activist who wants Jews to be able to pray at the site. The site will be open Friday. The Dome of the Rock Mosque in the Al-Aqsa Mosque compound, known by the Jews as the Temple Mount, is seen in Jerusalem's Old City. Israel closed the site to all visitors on Thursday following an assassination attempt on a right-wing Jewish activist. Palestinian Authority President Mahmoud Abbas has condemned the closing of Jerusalem's Temple Mount for the first time since 2000, calling it a "declaration of war" on the Palestinians. 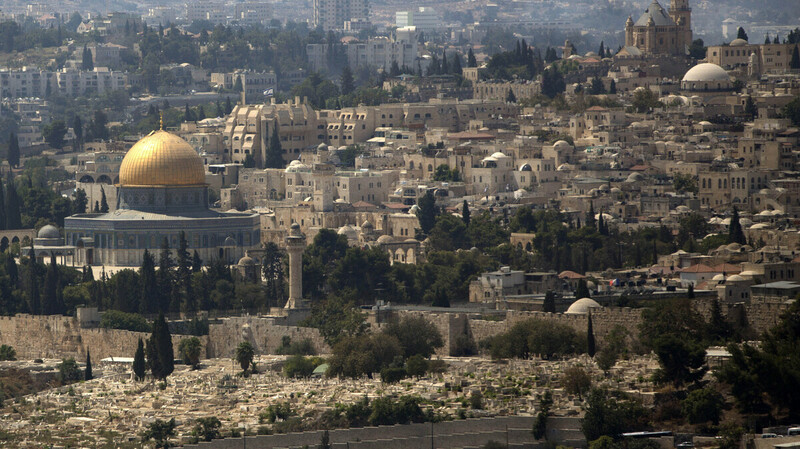 "Harming the places sacred to Muslims and Christians is a red line," Abbas' spokesman said. The spokesman added that Abbas would "not permit this line to be crossed." The comments were reported by Israel's Haaretz newspaper. Israel closed the compound, which houses Al-Aqsa mosque, Islam's third-holiest site, after an assassination attempt late Wednesday against Yehuda Glick, a right-wing activist who wants Jews to be able to pray there. Glick was seriously wounded. The suspected gunman, a Palestinian identified as Moataz Hijazi, was shot dead Thursday. Israeli police said late Thursday that the complex would reopen Friday, which Palestinians have called a "day of rage." Israeli police said the prayers would be restricted to men over the age of 50 and women of all ages, Haaretz reported. Jews consider the Temple Mount sacred because it once housed the First and Second Temples. Jews can visit the site but cannot pray there. "The Temple Mount has been a flashpoint for violence in recent months and has been fraught lately with clashes between Palestinian protesters and Israeli police. ... Israel maintains that it allows free prayer to all, but Palestinians claim it [Israel] is unilaterally widening access to accommodate larger numbers of Jewish worshippers. The Palestinians see this as Jewish encroachment on the site, the holiest in Judaism and the third holiest in Islam, while Jewish activists like Glick say they are being discriminated against by limiting their chances to pray atop the mount." The Temple Mount was last closed to all visitors following a visit in 2000 by Ariel Sharon, who at the time headed the-then main opposition Likud party. The violence that followed led to the second Palestinian intifada, or uprising, which lasted until 2005. Before that, it was previously closed completely in 1967. Haaretz reported that Jerusalem was on high alert following Wednesday's attack, and hundreds of police were sent into the city as reinforcements. Israeli Prime Minister Benjamin Netanyahu called for calm. "First of all, the flames must be lowered," he said. "No one on either side should take the law into his own hands. We need to act now with cool heads, responsibility and determination, and that is what we shall do." The Israeli leader also criticized Abbas, the Palestinian president, saying: "We're facing a wave of incitement by radical Islamic elements as well as by the Palestinian Authority chairman ... who said that Jews must absolutely be prevented from going onto the Temple Mount." The AP adds that Abbas recently called for Jews to be prevented from entering the site, calling them "a herd of cattle."